“The Earth is under attack by the Zentraedi. Their fleet of gigantic alien warships is capable of destroying an entire planet in a split second. The only hope for survival lies in the secrets of Robotechnology, an advanced alien tech which has given the human race access to powerful robotics systems and interstellar spacecraft. At the turn of the millennium, a mysterious unmanned Robotech space battle fortress crashed into the Earth, containing valuable information which the scientists of the United Earth Government used to develop their own Robotech Defense Force. However, unfamiliar with these alien systems, the crew of this newly reconstructed Super Dimensional Fortress will face the nearly impossible task of defending not only their own lives, but the fate of the entire world. In Robotech® RPG Tactics you choose your force from an array of mecha led by either the heroic United Earth Defense Force or the villainous Zentraedi. You will lead these two mighty forces in a variety of combat theaters, from skirmishes in space on the Mars Colony to epic battles in Macross City and the rings of Saturn. That’s the intro text of Palladium’s 2013 Kickstarter, Wave one is now (2015) delivered. The KS suffered under some heavy delays and strange decisions. 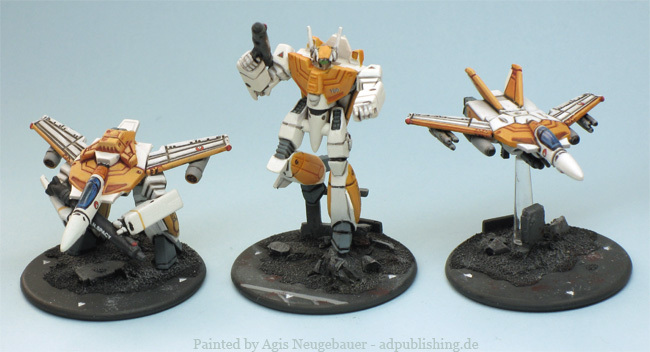 What counts for me - I got some some very nice Mecha models and a decent SF skirmish game. So time to paint some mechs! I started with a Veritech Valkyrie VF-1J in Battloid Mode. Bit tricky to assemble with some moldlines at the wrong places, but overall a VERY good 6mm (1/300) model! Another Fighter and the 1st Battlepod are assembled and primed.